6 1/2 Inch (3 1/2 Inch c-c) Traditional Doctor's Door Knocker (Polished Brass Finish) - measures 6 1/2 inches tall with a width of 2 inches. This knocker has a projection of 2 3/4 inches and it mounts with a hole center to center distance of 4 inch. Comes complete with the mounting hardware. Solid Brass construction for decades of service. 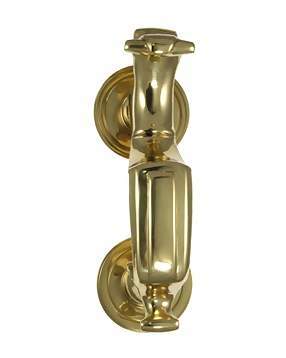 Available in Polished Brass (shown), Antique Brass, Oil Rubbed Bronze, Satin Nickel and Polished Nickel.